Sarah Polley is an actress, writer, and director whose career began in the mid-1980s. She comes from a rather dynamic family in Toronto. Her mother, Diane Polley, was a stage actress and her father, Michael, also had a short-lived theatrical career until the two married and had children. Sarah, the youngest of several children, looked and acted differently than the others, enough that jokes and rumors pervaded the family. Over time, these light-hearted quips gained a heavier context as the children began to learn that their mother, Diane, engaged in several relationships while working on a play in Montreal. After Diane’s death from cancer and all the older children left for college, Michael raised Sarah alone. Stories We Tell is constructed out of both archival and recreated Super 8 as well as talking head interviews with Sarah’s siblings, father, and the friends and lovers of Diane. What is cobbled together is a narrative that illustrates Diane as a woman who loved life, but the central story is to uncover the mystery of who Sarah’s father was. Of course the weeks Diane was in Montreal was the obvious period for Sarah to begin her search. There are many films where the unreliable narration comes from an amalgamation of different stories. Consider films such as The Social Network, which tells the story of the formation of Facebook from different perspectives. The purpose was not to tell an accurate story; the outcome was to create a modern myth of innovation. 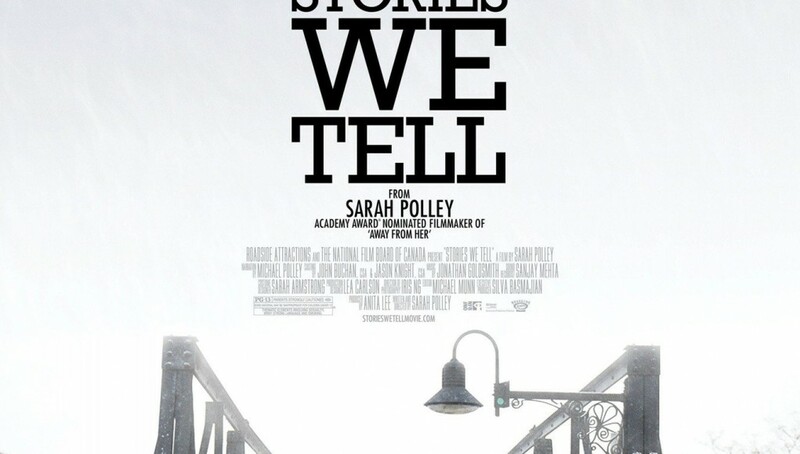 For Stories We Tell, the film weaves together separate interviews with family, friends, and lovers to create an idea of Diane Polley’s adult life from multiple perspectives. Even the subjects at the end of the film ponder Sarah’s expectations for the project, and the possibilities of multiple viewpoints can create discrepancies in the story; ruminations that force the documentary to become self-reflexive. In the end, they are right. The film has to backtrack and fill in new information as it comes available, a strange choice given that this information could have just have easily been inserted in chronological order. However, this achronological structure puts the audience into Sarah’s perspective as new fact come to light. The final outcome is that Diane was an energetic woman who did not get the romantic attention from her second husband, Sarah’s father, and that Sarah is discovering something about her that does not change her family dynamics all that much. The majority of the film is narrated by Michael when not illustrated by the interview subjects. This narration is strange, if not cruel, since Michael is narrating a conclusive summary of Diane’s infidelity. His voice is authoritative and respectful of the words that his talented daughter wrote. The recording of Michael’s narration was also filmed and presented in the documentary, sometimes with Sarah directing lines to be repeated for perfection. With the rest of the film in context, this footage is endearing as a father and daughter work together in a relaxed and focused manner. 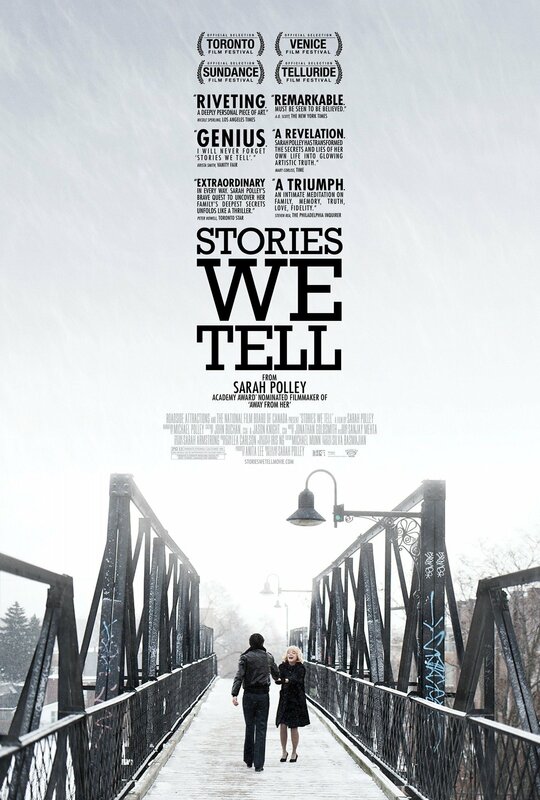 Stories We Tell is a charming documentary that balances humor and uncertainty with aplomb, and the central narrative that is constructed from distinct voices becomes a joyous detective story. Sarah Polley’s previous film, Your Sister’s Sister, a narrative, also explored themes of infidelity in complex social and familial structures. Like the voices of Sarah’s family and friends that have to be patched together to create a better understanding of her existence, we might be seeing Sarah’s own story as an auteur appear through a patchwork of the films she has directed. In the meantime, Stories We Tell is a story rarely heard in this format, although the stones turned are certainly not uncommon.